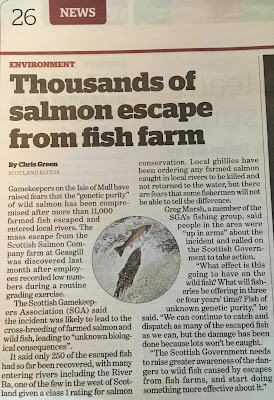 River workers are expressing growing concern for wild salmon around Mull after it emerged a recent escape from a local fish farm saw over 11 000 farmed fish entering rivers. On August 21st the escape from a Scottish Salmon Company farm at Geasgill near Ulva was reported to Marine Scotland after employees noted low numbers during a routine grading exercise. It has now been confirmed 11 040 farmed salmon have entered local rivers including the River Ba, one of very few rivers in the west of Scotland given a class 1 rating for salmon conservation. On four beats directly affected by the escape, a total of around 250 of the fish have been accounted for, leaving thousands traveling through local systems. Ghillies have been ordering any farmed salmon caught to be killed and not returned. However, given other high profile escapes around the island’s waters there is now real concern that cross-breeding between cage escapees and wild salmon will weaken the wild gene pool, with unknown biological consequences. There are also longer-term fears over the health of wild fisheries being expressed by riparian owners around the affected river system, with visiting anglers landing modified fish. Greg Marsh of the SGA (Scottish Gamekeepers Association) Fishing Group, who looks after operations at River Coladoir and Loch Scridain says Scottish Government attempts to make aquaculture more environmentally sustainable are not working. “The Ba is a class one river, which means it is rated by Scottish Government scientists as having the highest grading for conservation of wild salmon. “There are now a lot of farmed fish through it and up into Loch Ba. People here are up in arms. “What effect is this going to have on the wild fish? What will fisheries be offering in 3 or 4 years’ time? Fish of unknown genetic purity. “We can continue to catch and dispatch as many of the escaped fish as we can but the damage has been done because lots won’t be caught. Marsh says all Scottish anglers now need to now be able to identify farmed salmon in rivers to ensure the fish are not being re-released into the system, if caught. Back in April this year 20 000 fish and 1300 wrasse escaped from a Scottish Sea Farms plant at Bloody Bay on Mull, with predictions that some of those escapees will now be in mainland rivers. “One of the key differences in appearance between wild and farmed salmon is that the vents on a wild salmon will be reddy/brown and slightly swollen at this time of year. “Farmed salmon have silver vents, their adipose, tail and pectoral fins look smaller and are often shredded and there is very little to identify whether they are male or female.